Blog What to read to succeed? Many of young avid students wonder what the best resources are out there to prepare for the IBO, USABO, etc. There is no single answer, however, I will try to outline the best books from my own personal experience. It is not a secret that the Bible of Biology is “Campbell Biology“. It is a good book and covers all fundamental biology topics, nevertheless, some topics are discussed only concisely so some good books in addition to Campbell’s could come in handy. Note that editions do not that matter but I prefer 9th edition to 10th edition because this newest version lacks key illustrations. Life: The Science of Biology by David Sadava et al. is a book similar to Campbell’s but contains some different information as well as more comprehensive images. There are quite good study resources from this book here and here. I personally adore Raven et al. BIOLOGY Tenth Edition. Here you can find some samples of chapters from this book. I myself found here some facts I did not find in any other book. For example, Raven interestingly presented motives of proteins or unique examples of behaviour ecology. Next, to me the best genetics book is Brookers Genetics: Analysis and Principles or Genetics: A Conceptual Approach by Benjamin Pierce. These textbooks present an experimental approach to understanding genetics and what I like most is that there are plenty of problems with explanations and answers. What is more, various laboratory methods are depicted in diagrams so you do not need to work in a lab to get essential practical skills (of course, it is better to do some practice in lab so that not to fail in the IBO practical part). Here you can get a better grasp of what is in this textbook. Moving on to the next book I would like to suggest the best book for molecular biology, Molecular Biology of the Cell by Bruce Alberts, et al. This is book is a big one, a hard one, an interesting one, a useful one. From my point of view, current and upcoming IBOs are focusing on molecular and cell biology because these fields are developing so rapidly and thus these branches of biology are perfect source for olympiad problems. So try to read it and understand it. For a shorter book check out BIOS Instant Notes in Molecular Biology by Alexander McLennan et al. If you want something cheaper than Alberts but equally useful, try Molecular Biology of the Cell, Fifth Edition: The Problems Book. The Problems Book helps students appreciate the ways in which experiments and simple calculations can lead to an understanding of how cells work by introducing the experimental foundation of cell and molecular biology. Each chapter will review key terms, test for understanding basic concepts, and pose research-based problems. The Problems Book has been designed to correspond with the first twenty chapters of Molecular Biology of the Cell. Biology is nothing without chemistry so you need to know the basics of the latter one. My favourite book is the Color Atlas of Biochemistry by Jan Koolman, K. Rohm. It is a pocket-size concise book (approximately 400 pages). What I like most is that every page on the left contains theoretical part and every page on the right depicts diagrams, illustrations, graphs and so on. So if you remember better by looking at illustrations, I highly recommend to read this little textbook. For more comprehensive information on biochemistry I would recommend to read Principles of Biochemistry A. L. Lehninger, D. L. Nelson. Some teachers also recommend Biochemistry by Donald Voet, Judith G. Voet but this one is as comprehensive as Lehninger’s. As far as practical part of IBO is concerned, I have not found a better book than Practical Skills in Biomolecular Sciences by Rob Reed. This textbook underpins any practical course in biochemistry, biomedical science, genetics, immunology and microbiology. Not only it includes numerous exercises with answers, but also foster study and examination skills, laboratory and analytical skills, investigative techniques and analysis of experimental data. Another good book is Principles and Techniques of Biochemistry and Molecular Biology 7th Edition by Keith Wilson. This best-selling undergraduate textbook provides an introduction to key experimental techniques from across the biosciences. It uniquely integrates the theories and practices that drive the fields of biology and medicine, comprehensively covering both the methods students will encounter in lab classes and those that underpin recent advances and discoveries. Its problem-solving approach continues with worked examples that set a challenge and then show students how the challenge is met. New to this edition are case studies, for example, that illustrate the relevance of the principles and techniques to the diagnosis and treatment of individual patients. Coverage is expanded to include a section on stem cells, chapters on immunochemical techniques and spectroscopy techniques, and additional chapters on drug discovery and development, and clinical biochemistry. Experimental design and the statistical analysis of data are emphasised throughout to ensure students are equipped to successfully plan their own experiments and examine the results obtained. Many past IBOs contained quite a lot of questions about plant anatomy and physiology. So I suggest for plant biology to read Stern’s Introductory Plant Biology AND/OR Plant Biology by Thomas L. Rost, Michael G. Barbour, C. Ralph Stocking, Terence M. Murphy. Here you can take a look inside the latter book. Another amazing book for plant biology is the famous Biology of Plants by Peter H. Raven, Ray F. Evert, Susan E. Eichhorn which is quite officially recommended. For animal biology you should read Biology Of Animals by Cleveland P. Hickman Jr., Larry S. Roberts, Allan Larson or Animal Physiology by Richard W. Hill, Gordon A. Wyse, Margaret Anderson. Animal Physiology presents all the branches of modern animal physiology with a strong emphasis on integration of physiological knowledge, ecology, and evolutionary biology. Biology Of Animals presents coverage of animal form, function, diversity and evolution. In this sixth edition, the cladistic perspective (phylogenetics systematics) has been added to the discussion of animal phyla, and cladograms of the relationships are included. For human body anatomy and physiology great books are Human Physiology: An Integrated Approach by Dee Unglaub Silverthorn or Vander’s Human physiology 11th edition. The newly revised Human Physiology: An Integrated Approach strengthens the coverage of the “big picture” themes in the study of physiology and helps tie concepts together in a logical framework for learning. Vander’s human physiology reflects some of the major themes of the textbook: homeostasis, exercise, pathophysiology, and cellular and molecular mechanisms of body function. You can take a look at one of the chapters of this book here. I also read Human Physiology 12th Edition, by Stuart Ira Fox. This book is meant for the one-semester Human Physiology course typically taken by allied health and biology students. The start chapters introduce basic chemical and biological ideas to offer students with the framework they should comprehend physiological principles. Moreover, the chapters promote conceptual understanding. For microbiology I would suggest Brock Biology Of Microorganisms. This book for biology, microbiology, and other science majors balances cutting edge research with the concepts essential for understanding the field of microbiology. 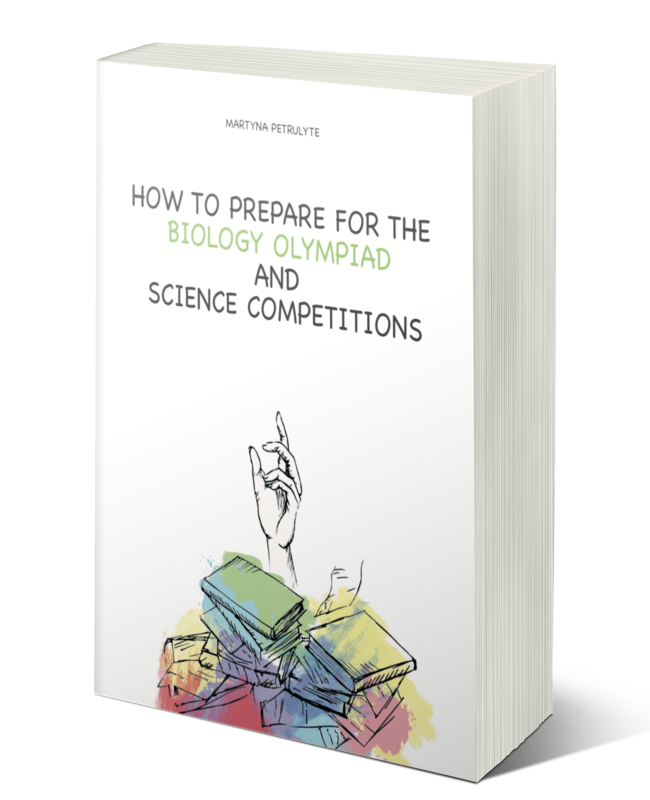 Lastly, in 2018 we have published the Biolympiads book ‘How To Prepare for the Biology Olympiad And Science Competitions‘ so check it out on Amazon. In other posts, I will share my recommendations how to read books and how to prepare for biology olympiads efficiently and quickly. Please do not hesitate to leave a comment with your favourite reading list!